This little guy can easily fit into the palm of your hand and is able to perform all sorts of crazy acrobatics. It rolls, flips, flies… it will even make you a cup of coffee if you ask it nicely! Jokes aside, because this little guy is able to provide you or your little ones with a ton of fun. It has an extremely durable frame and is equipped with bright LED lights that prevent you from losing it during nightly fun. Combine that with different speed modes, built in gyroscope, prop guards, spare blades and a charging cable and you will understand why this is such a popular choice of drone with wheels. And finally, specification-wise, the control distance is cca 25 meters which is not that great, but its battery lasts up to 6 minutes which is amazing considering it only takes 9 minutes to charge it to 100% again. Syma, one of the most popular drone manufacturers in the world, has released yet another interesting drone and widened their lineup of amazing drones even further. 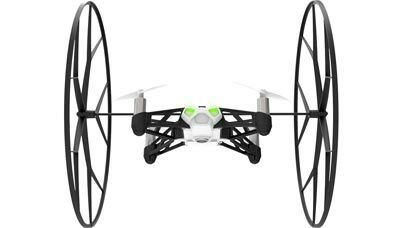 Their X9 is a beautiful looking drone that looks like a car with its motorized wheels, but is in fact a fully-fledged drone as well due to its propellers on top of each wheel. 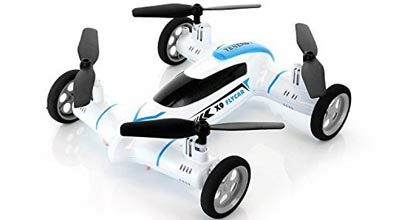 Just like the Taotuo’s model (more on this down below), the Syma X9 is also a 2 in 1 model which means it can both fly and drive at the same time. It has all the standard features such as one key roll, 3D lock, more scheduled flight and 360 eversions, so nothing special in this department. When it comes to its specifications, it can last up to 5 minutes of flight time (7 if you only drive it around) and can reach up to 50 meters without any lag spikes appearing. This miniature drone comes with prop guards and 2 sets of wheels (just like the Cheerwing down below), one big and one small. 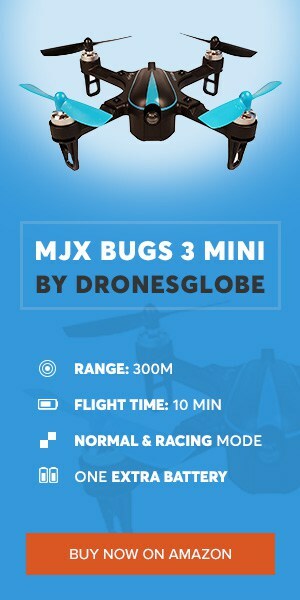 It has a built-in 0.3MP camera (quality is not that good if we are to be honest here) along with the industry standard 6-axis gyroscope for an extra bit of stability in midair. Another great thing about XuanLei 4 in 1 are its LED lights that shine really bright (like a diamond, a certain pop star would say) which helps you see it even during night time. Specification-wise, this little guy can last up to 7 minutes, a minute more or less, depending on the set of wheels you are using. Its control distance is ca 50 meters which is not that good, but for this price range (and with all the extra equipment) it will have to suffice. 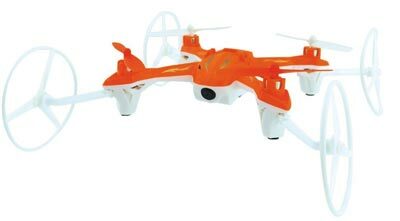 To start with this drone off, first we need to say that it is not 2 in 1 and it is 3 in 1. 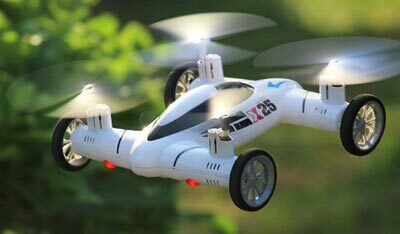 This little fella is a 4 in 1 machine that is able to fly, climb, run and drive like a champ! 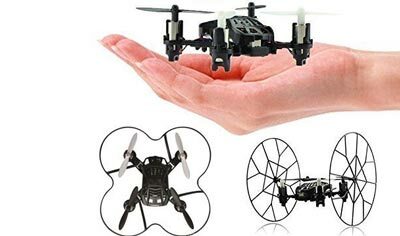 With additional accessories in the form of extra wheels, you will get numerous options that will greatly increase your experience regarding this drone. You will get a total of 6 wheels, 4 small ones (for climbing and running) and 2 big ones for driving around. With all the standard features such as 6 axis gyroscope, 4 channel functions, 360 flips, this little guy has a great additional one – it can easily climb walls. Unfortunately, the only thing it lacks in is its range which goes for about 30 meters after which lag strikes. Luckily, it compensates for it with around 7 minutes of flight time which is more than good for this price range. For just under $50 you can get this mix of an RC car and drone. Truth be told, it does not look really pretty, but it has a bunch of features that will make up for that. For instance, it has real motorized wheels unlike some others who are just there for rolling purposes. That’s right. This little fella can both fly and drive around on the ground. It’s basically a 2 in 1 toy. As you’d expect, it is packed with handy features such as auto return, 360 eversion, LED lights, and the 2 RC modes that I already explained above. If you are wondering about its specifications, you will be happy when I inform you that it is able to reach more than 100 meters away from its transmitter and fly up to 9 minutes before draining its battery. All things considered, there is no doubt that Taotuo did an amazing job with this bad boy, and as such, you should consider opting for it if your child cannot decide whether he wants an RC car or a drone… Why not both? As its name suggests, this little fella awfully resembles those extremely fast Formula 1 vehicles. This is most likely one of the reasons why kids are so crazy about it. Luckily, it is not all about looks. The Contixo F1 Plus is made out of quality mix of plastic and alloy which makes it quite durable and shock resistant. It sports a built in 2MP HD camera and provides you with a 4GB MicroSDHC card for storage purposes. When it comes to its functions and features, this little guy has 360 rolls, 3D flips, hovering mode and one key return to home. In addition to all of this, the Contixo F1 Plus also has automatic takeoff and landing which is something most of you will greatly appreciate. I am sure most of you (if not all) have heard about Parrot. They are one of the leaders in drone market and as such, this list could not end without at least one of their products. Luckily, they have just released a new drone with wheels in their lineup, and boy oh boy, it has some nice tricks up its sleeves. It is able to reach top speeds of whopping 18 kilometers per hour which is admirable considering its size. In addition to that, it can do 90 and 180 degree turns along with those good old 360 flips with just a single push of a button. 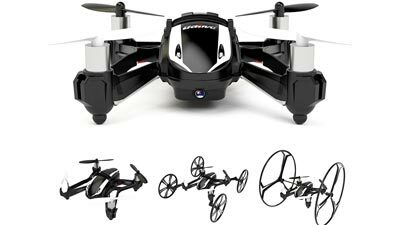 Its wheels are removable and it sports a mini action camera that you can use to capture aerial (or ground) footage. When it comes to its specifications, it can only reach up to 20 meters away from your phone (it only works via Bluetooth on smartphones or tablets) but can last up to 8 minutes in air if you remove the wheels (6 if they are not removed). And the last spot of our best 5 drones with wheels’ list has been taken by Fanala JJRC H3. It’s a great looking drone that looks like a real mix between an RC car and a drone. Its frame resembles a car but its huge rollers (wheels) give away the fact that they’re there to support prop guards that are mounted right next to the frame itself. It sports LED lights that nicely illuminate the ground underneath it, and is able to travel up to 300 meters away from its transmitter which is nothing short of breathtaking, especially for this price. 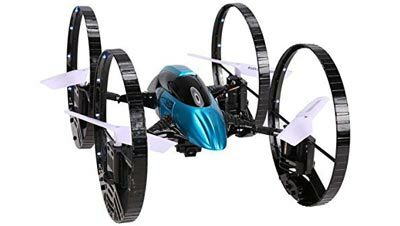 Combine that with its flight time of up to 8 minutes and you got yourself a great wheeled drone that will provide you with a ton of fun time in and time out! Finally, we have gotten to the end of the list. Truth be told, it was not that huge as it only featured the top best models in this category. As you could see for yourself, these drones are looking rather interesting. Unfortunately, there’s not a whole bunch of them which is the main reason we listed 5 best ones. Whether or not this will change in the close future we don’t know. But what we do know is that they look awesome and provide a great amount of fun… And those two things are what really matters! Meet Airblock Modular Drone. The Future of STEM Learning ?